The broader initiative will look to bridge multiple elements of NEX's services suite, connecting BrokerTec and ENSO. NEX Regulatory Reporting will be gearing up for the rollout of a newly dedicated reporting solution, following the issuance of the final technical standards from ESMA. In tandem, the group will be applying to become a trade repository for the Securities Financing Transactions Regulation (SFTR), which will come into effect in 2019. NEX Regulatory Reporting is the result of the acquisition of Abide Financial back in October 2016. The deployment of a focused reporting solution will help support its existing client base. In particular, adding the SFTR trade repository and solution to its already robust Global Reporting Hub will provide clients with an end-to-end solution for the securities lending and repo markets. “It’s important that service providers and clients alike begin to prepare for the impending regulation now, to avoid the last-minute rush for compliance that many in the market are currently experiencing ahead of MiFID II,” he reiterated. NEX Regulatory Reporting has been planning for MiFID II for months, having previously garnered authorization from the UK’s Financial Conduct Authority (FCA) for Abide Financial as an Approved Publication Arrangement (APA) in the new regime. 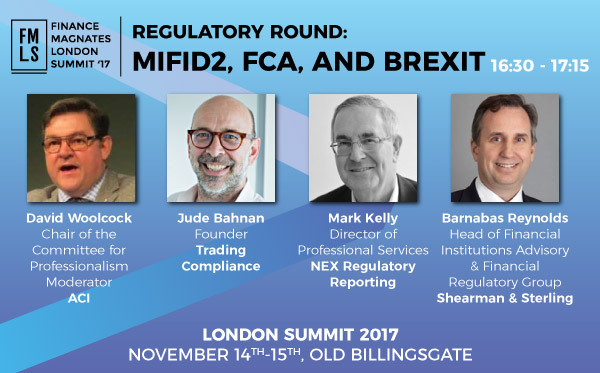 MiFID II and its upcoming implementation will be an extensive area of focus at the 2017 Finance Magnates London Summit next week at Old Billingsgate. This include multiple panel discussions and seminars specifically dedicated to focusing on the new regulation. Mark Kelly, Director of Professional Services at NEX Regulatory Reporting, will be participating in the discussion. The latest initiative from NEX will bridge multiple elements of its overall services suite, helping connect BrokerTec and ENSO platforms. This will facilitate the automatic transfer of transaction data to the SFTR trade repository, pending issuance of the final technical standards from ESMA. The process is still in review by the European Commission, as ESMA is expected to release the final draft technical standards within the iupcoming months. Such a utility will be instrumental in streamlining both platforms. BrokerTec EU repo platform currently processes 10,000 repo trades per day for over 90 clients, while the ENSO platform services over 100 hedge fund and asset management clients. The advent of a unified solution will be an instrumental service for NEX’s growing client base. “While most markets are used to a degree of regulatory reporting under EMIR, MiFID I and in now preparing for MiFID II, securities lending has to date been an unregulated market and so the introduction of SFTR will impact many global and regional banks and the buy side. Pending detail on the regulatory technical standards, we look forward to launching a complete SFTR solution and providing direct reporting access to NEX’s BrokerTec and ENSO clients,” added Collin Coleman, Head of NEX Regulatory Reporting.